My kids could not understand the concept of a time capsule no matter how many times I explained it, so we watched a few videos on YouTube. In one, a man used a metal detector to find his time capsule, a re-purposed Dukes of Hazard lunchbox. When he finally opened it some twenty years after he buried it, with his young daughter along for the adventure, he discovered a decomposed Yankees hat, a photo where his image had been washed out, and some wet baseball cards. My daughter kept referring it to us building a “time castle” and I still think she had no idea what we did tonight. An ongoing situation in my house is the refusal to part with toys. I suggested they put a few objects inside our capsule, a plastic jar some farmers market pickles came in, but neither could commit to losing a possession for essentially twenty years. My son deposited a red Hot Wheels car, only to change his mind and remove it five minutes later. 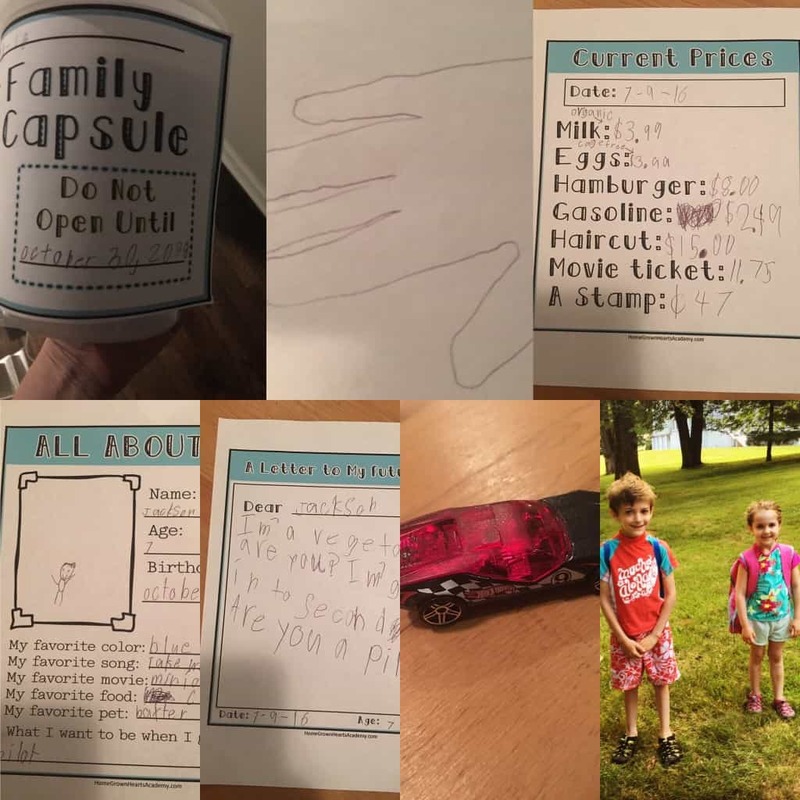 We rolled a bunch of recent photos into the container, some with captions, traced hands of each of my kids, included a price list (of movie tickets, gasoline, etc.) and a letter to my son’s future self, along with some favorites memories, and “all about me” sheets. On the current event sheet that my husband mainly filled out, he wrote about the #blacklives matter shootings and protests, Donald Trump’s bid for the presidency (only my son’s future self knows how that turns out for sure), and the death of Prince. Note: I must give credit to this website for the free templates I downloaded. Despite the fun factor of burying a time capsule and drawing a map, I have mixed feelings on it based upon the condition of some of the unearthed ones that we watched in videos. I told the kids we will think on it for a few days. Otherwise, up in the attic it will go. If anyone has a suggestion on how best to preserve it if I bury it, please let me know. I’m also a little concerned that all my printed photos on plain old computer paper will fade to nothing, and considering that’s the bulk of our memories, that’s pretty sad. I got choked up putting a photo of our 10-year-old French Bulldog inside the capsule, the one thing I know for sure that cannot survive the twenty-two years. I have a vague memory of creating a time capsule as a ten-year-old. I’m pretty sure I never buried it and the only thing that remains is a photo of me and a friend on that day, decked out in our ever popular neon sweatshirts and those plastic charm necklaces. Has anyone ever done this before? I have to admit, I think I found it more exciting than anyone. Although, I bet that has something with my kids not fully comprehending the passage of time. Bittersweet, my friends. 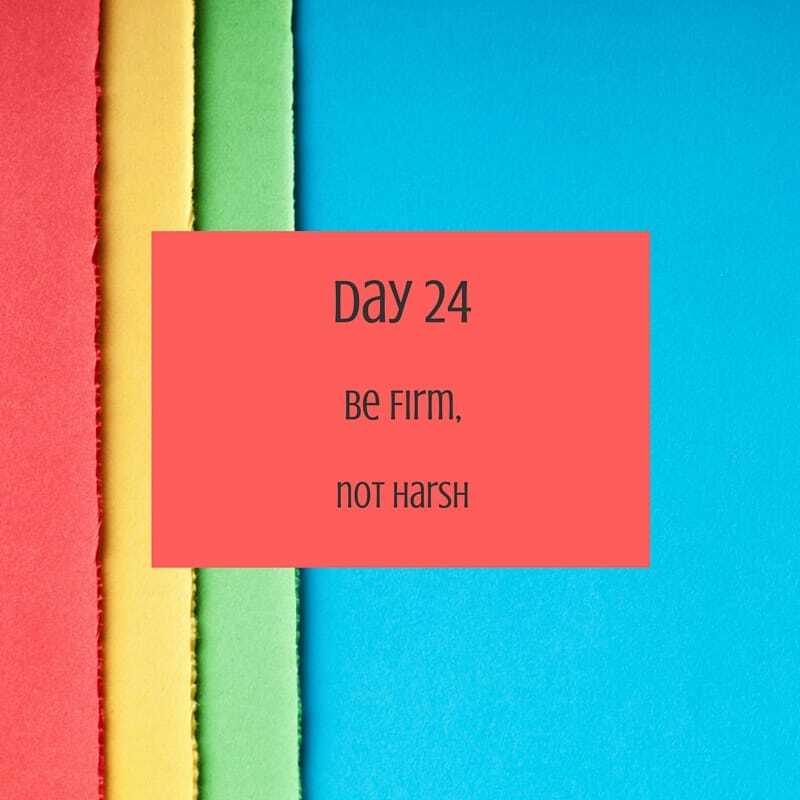 Are you ready for Day 24? The challenge is . . . This isn’t a daily occurrence for me, but it happens enough that I need to work on it. There’s a big difference between firmness and harshness, the latter uses angry words. To get a better understanding, read more about it here.